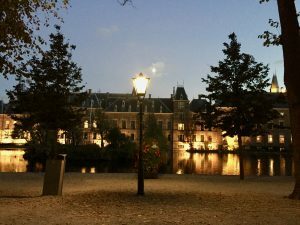 As the sun sets on my way home from work, I decide to stop my bike in the promenade across the lake from the Binnenhof, the Dutch parliament. Every evening at sunset, hundreds of parakeets descend on the island in the middle of the lake, filling the sky with their screeching song. Sat alone on a bench, staring into his phone is a Latin-looking man wearing a dark, shabby baseball cap, a dark, old tracksuit, and a faded black down jacket with a fur-lined hood. I wonder how he might describe his beliefs in this moment. I believe that there is a god. Some spirit of force. I know that many religions see it in a different way but go to the same god. So what is god? god is everything. God is breathing through every organism in the universe. It’s like everyone has god inside. We’re part of him; He’s part of us. Individually, but also in that we’re part of everything. Since I was a kid in LaSalle, I followed the normal Catholic religion. I was raised going to church on Sundays. Went to a Catholic school. But in a certain point of my life I started to learn other things. I realised that Catholicism is just a religion. I read books about other things – metaphysics mainly. And I started to philosophise. I felt the philosophers talked about the same stuff but deeper. It was more to do with being in contact with a kind of energy. Not just mechanically going and praying. You know, real practices that are drawn from past cultures that have been lost through time. The real path. And the world’s big religions have lost that. So I read things like Samael Aun Weor’s The Great Rebellion: The State of Our World and how to Change it through Practical Spirituality. Some people think really different about human beings. Sometimes I pr[ay]…or I adopt these different techniques to change the way that I perceive the world. Living in such a world of destruction is difficult. And we’re full of so many mistakes that we have to…to not just go with the flow but to detach ourselves from the world. We can still live the same life. Just not put so much energy into pointless things. Normal things like…say my car breaks down and I’m [waving his arms in the air] “ahhh this is horrible”. But that’s waste of spirit. The spirit has to be quiet. And that way, maybe, we can get closer to god. I wouldn’t say I identify with any religion or philosophy because the idea of identifying is very human. But I feel. It’s not religion it’s…everything…you don’t have to go anywhere special to do it. You can just practice for yourself. Every day. Every moment. Every moment that you remember to at least. Because sometimes you can’t have that kind of lightness…it’s really hard. In the end all it is is that every process has to be healthy. Not so rushed – just…[he gestures a soft landing with his hands]. Every religion has their own way of doing it. In fact you can’t even say religions…that’s just an invented word…perhaps just sets of information…or…Maybe if religions listened to each other, they’d get the best of everything. Of course I contradict this all the time. But in the end, if you have a little bit of this in your heart, then when you’re about to do something or think something bad…I mean we spend so much time thinking about stupid things. Spending too much time thinking of money…women…things that distract you from what’s called the soul. The parakeets get louder now, almost drowning out our quiet conversation. Just this: what you have, what you see, and what you’re experiencing and smelling in the moment. That’s the best way to connect to the light-energy that is god. God doesn’t think. He vibrates. We’re trying to enter into the vibration zone where human beings can experience a sense of connection with nature and ultimately with god. To be honest that’s not what I’m really doing sitting here though. I was just looking at Facebook: one of the many stupid things!